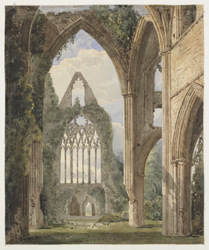 This watercolour depicts the interior of the tall, majestic ruins of Tintern Abbey. Tintern was founded as a Cistercian abbey by Walter de Clare, Lord of Chepstow, in 1131. The present building originated in the thirteenth century and prospered until the 1530's. It then met its fate when Henry VIII decided to appropriate the wealth of all monastic buildings throughout the kingdom. The imposing remains became a magnet for many poets and artists, such as William Wordsworth, JMW Turner and the author of this picture, Charles Buckler.